Physics Buzz: Planets Orbiting Stars Orbiting Planets Orbiting Stars Orbiting…. Planets Orbiting Stars Orbiting Planets Orbiting Stars Orbiting…. Multiple planets orbiting a star other than our own sun- a dizzying thought that has been confirmed for the first time by images from the Gemini North telescope and the W.M. Keck Observatory on Hawaii's Mauna Kea. 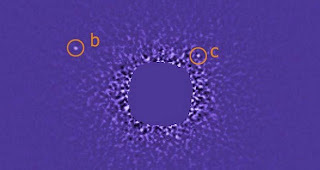 A group of researchers produced novel pictures of a small solar system comprising three planets (two of which are shown in the image above) orbiting a star called HR 899, about 130 light years away from Earth. The pictures are extraordinary because until now, distant planets orbiting stars had never been directly and visually observed. Most other star orbiting planets have only been observed indirectly, when their path of orbit lay between Earth and their host star, or through gravitational effects. According to calculations done by the researchers, all of the planets weigh roughly 7-10 times more than Jupiter. They orbit a ginormous star too, about 1.5 times heavier and 5 times brighter than our sun. Despite the differences, this fledging solar system is similar to our own, orbiting much like our own remote planets do. The planetary triad was easier than usual to spot, partly because all three planets had the bright glow of an approximately 60 million year-old youth. Still reeling from their gravitational collapse, the planets continue to glow brightly. Consequently, they generated enough heat to be seen in the infrared spectrum. The researchers were then able to photograph the planets in infrared light using a technique called adaptive optics. Adaptive optics works by correcting the distortion or twisting and bending that light undergoes as it enters Earth's atmosphere. Over the years, steady improvement in this technique has allowed ground telescopes to snap photos of far-off bodies with as much acuity and colorful intensity as those from the Hubble. With further probing and increasingly sophisticated technology, astronomers may eventually find the equivalent of cosmic gold: a planet-like earth orbiting a sun-like star. Who knows, they may even find human-like life too.